Today, I’d like to share just a little about one of my favorite stones of all time, “Alexandrite.” This amazing color-changing gem has a most fascinating history. It was discovered in Russia around the time that Tsar Alexander II was celebrating his 16th birthday in 1834 and it was named after him. This gem came to be intrinsically tied in with Russia’s dramatic history and fascinated the Russian aristocracy and future generations. It was also said to be the favorite gem of Tsarina Alexandra. Her wistful beauty and the story of her tragic life cannot fail to move anyone. To this day, Alexandrite is associated with duality, hope and sadness, pain and pleasure, loss and life, tears and laughter. This is truly a mystical and fascinating stone and it definitely appeals to those with a literary or artistic sensibility. Looking at genuine Alexandrite can evoke strong emotion in a sensitive person. In daylight, Alexandrite is green or blueish green (symbolizing ‘hope’) changing to red or purple or lavender (symbolizing ‘blood’). Natural Alexandrite does not come in any other colors than this (if it is yellow or brown it is probably color change crysoberyl which is often sold as Alexandrite). The closer the green is to emerald and the closer the red is to ruby, the more valuable the stone. It is extremely rare to find a stone which changes to red however, normally the color is purple or lavender. Naturally mined Alexandrite is rare and valuable and very seldom comes in large carats. 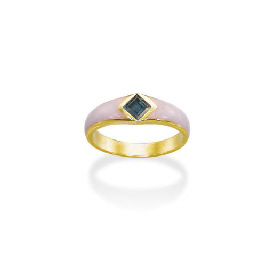 Nearly all of the Alexandrite you see today in contemporary jewelry is lab created. I personally would only look for something in a vintage setting with small stones as a big stone is almost certainly lab created (if it is natural it should command a very high price!) But only a trained and trusted gemologist can tell you for certain. Here is a natural Alexandrite specimen from the Ural mountains. This one is a spectacular true green and lavender.